When summer has come to an end and fall is approaching, you can expect significant storms and windy days. This is the best time of the year to check on the trees on your property, particularly the ones that are closer to your home. 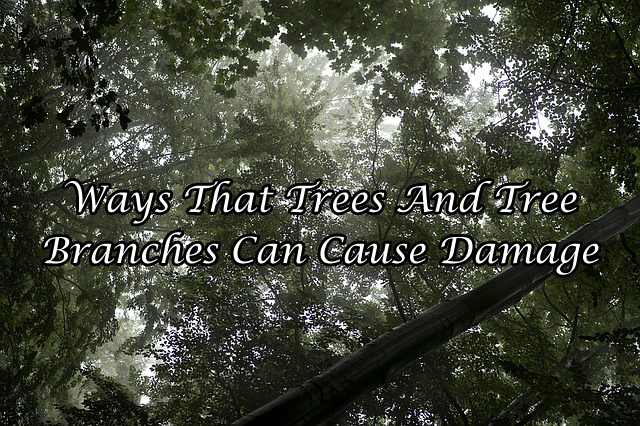 The NSDC (National Storm Damage Center) states that trees that become damaged by weather that is severe as the cause for over $1 billion in property damages in the U.S every year. Broken branches and fallen trees often damage structures, windows, siding, roofs, and cars. They are also very capable of toppling power lines. In many cases, the tree limbs are too close to shelters, and even though the branches may be in a state of health, they should still be regarded as a significant threat when it comes to your roof. For example, just a single branch that blows in the wind that’s rubbing your roof continuously will soon cause damages to the protective outer-layer of your shingles. When this top layer becomes compromised, the roof becomes susceptible to leaks. Also, leaves from these trees that are close to the ceiling can often clog up the gutter system, which results in the accumulation of rainwater, which can result in moisture damage or leaks in an area in the home such as the attic. Just about every home with a garden will have one or more trees in the area of the yard. In most cases, a stable and good tree in your front yard is regarded as desirable as it offers shade and adds to the aesthetic appeal of your home. However. When trees are not cared for properly, they can be a threat to the roof of your house. Here are four common ways that trees often cause damages to roofs. One of the more obvious potential sources associated with tree damage will be fallen branches. There may have been a storm which has caused one or more branches to slip onto your rooftop, which has scratched up the shingles or even left a hole in the roof. When trees become older, the limbs weaken, especially when there is rot or disease in the branches. To avoid this common issue, make sure you have all the trees in your yard trimmed annually. You should also use the services of an arborist to inspect the trees to ensure that they are not at risk. Trees are also known for dropping seeds, pinecones, needles, and leaves onto the surface of your roof. These are fine if they are only on the surface for a short while, but if you allow them to linger, your roof is at risk of damages and rot caused by decaying matter. To avoid this standard issue, you should ensure that your roof is cleaned regularly and avoid letting this type of debris accumulate. Trees may offer much-needed shade in the summer months. But this shade is also associated with added moisture, and when your roof has not seen the sun for a while in those rainy months, the shelter becomes susceptible to mildew and moss growth. You should periodically inspect the shingles for any signs of mildew, mold or moss growth. This needs to be removed immediately when you spot it. Needles and fallen leaves are also a risk for the gutters in your home. When cleaning your roof make sure you pay attention to cleaning out the gutters. The pine needles are particularly bothersome along with their sap. Avoid allowing your channels to remain clogged as this increases the risk of water damages to the roof the next time it rains. Roofing contractors suggest that you should be trimming all the branches of the trees that come within 6 feet of the roof. This will protect the roof from tree damages often associated with severe weather as well as stop small animals from running across the roof to gain access to the home for spring nesting. You need to look out for the trees that are too close to your home. For example, the trees that are positioned near enough that they could fall onto the roof when they are exposed to high winds, pouring rain, snow, and sleet. Tree experts and roofing contractors are the types of professionals that can offer you advice on the types of trees that need to be removed. When your property has experienced damages from falling branches or a tree you should immediately contact a roofing contractor. This professional will secure the damaged areas and prevent any further accidents to your roof as well as the inside of the home. Most of the homeowner’s insurance policies will cover a roof replacement that will be a requirement caused by fallen limbs of trees. But in the meantime, you need to carefully check to find out the actual extent of the damages that have occurred to your property. You should go into your attic to see if the roof sheathing has bowed or check to see whether the rafters cracked. You should also check for any puncture holes in the roof that may have been caused by broken branches. Tree branches when they are propelled by a wind that is strong can pierce your shingles or sheathing which can result in significant damages to the roof. Taking care of any tree hazards will not only extend the life span of your roof, but it can also avoid more severe property damages in the future. The first step to protecting your roof is to contact a professional arborist or roofer to conduct an assessment for hazardous trees. Remember always to remove any leaf and tree debris from the gutters to protect your shingles.